This episode of Outlander uses its time to set up a couple of conflicts that will play out as the season unfolds, setting expectations of tension incredibly high as an old friend of Claire and Jamie is reintroduced. Jamie also finds that the land he was given by Governor Tryon is not as easy to settle as he’d hoped, leaving the possibility of being unable to build enough of a settlement to pay the taxes on such a large tract of land. The episode itself is set up with two major storylines running parallel to each other, while a third featuring Roger gets a brief glimpse as the episode wraps up. 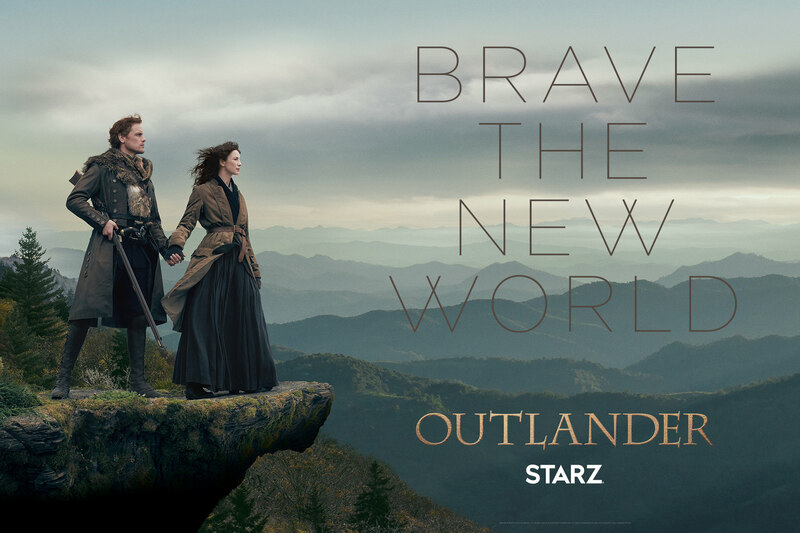 One storyline follows Jamie and Young Ian as they head into the nearest town in an attempt to interest settlers to come live on his land, while the other follows Claire as she delivers a baby for a neighbor family, the Müller’s, and unwittingly finds herself in the middle of a serious crisis. While apart, both Claire and Jamie realize they’re in the middle of something much larger than themselves that they can’t escape and will have to deal with in the future. Claire’s relationship with an older Cherokee healer woman is something she cherishes. Not only is she expanding her knowledge of herbs and medicine, but there’s also a real connection between the two women as they teach each other their languages. Beyond the friendship they’ve built is something more. There’s an insight the woman has into Claire, her abilities, and Brianna. In one exchange she asks Claire about Brianna, and when Claire tells her Brianna is far away (in time) the woman tells Claire that Brianna is here (as in this time period). 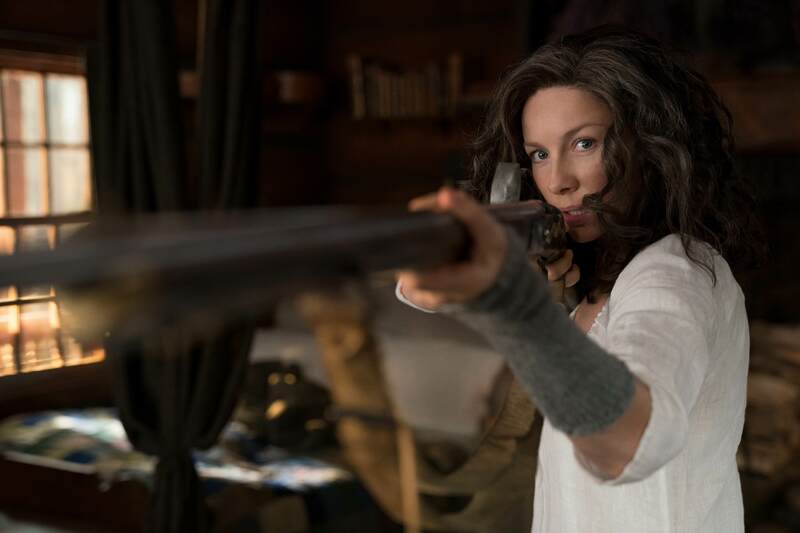 Somehow this woman is able to intuit or see Claire for who she is, and what she’s able to do. Unfortunately Claire will never learn what it is this woman knows about the area, and about Claire’s abilities in general. While delivering the Müller’s baby, a group of Cherokee men whom Claire recognizes come to fetch water for their horses at a stream right in front of the Müller cabin. The confrontation between Herr Müller and his son with these men nearly spills into bloodshed over something as silly as who owns the water. No one can really own something that moves through the landscape, and yet Müller believes it is his. Both sides have their guns drawn, and it is only Claire’s ability to talk out a compromise that saves bloodshed that afternoon. This momentary reprieve of violence is later thwarted by superstition, combined with a flare up of the measles. Jamie finds interesting townsmen in his land is hard to do, even with incredible terms. After being spurned by nearly everyone he pitches Frasier’s Ridge to, he finally finds out why people are so wary of farming. Governor Tryon’s tax collectors and sheriffs are corrupt, and overly tax people. Many a Scotsman has lost everything they owned to these men. 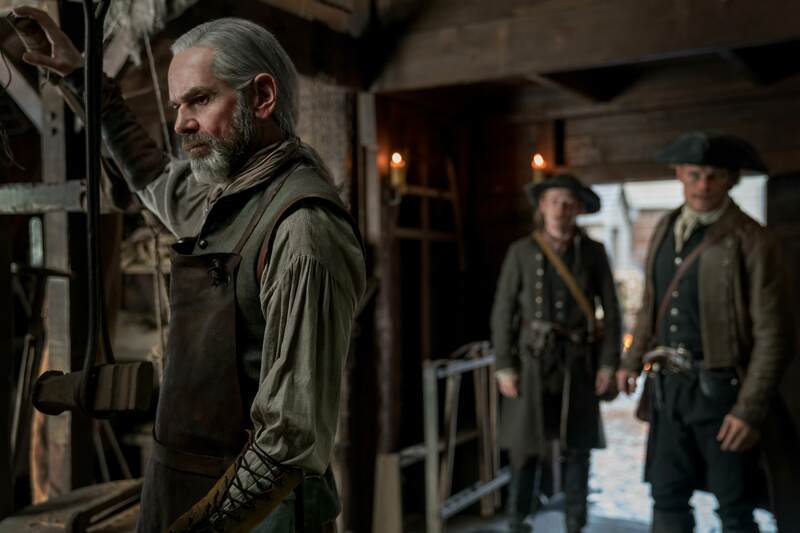 When Jamie has nearly given up on finding anyone, he and Young Ian bump into Murtaugh, whom Jamie soon learns is the village blacksmith and one of the leaders of the group calling themselves The Regulators. This is the very same group Jamie pledged to Governor Tyron he would help put down if an uprising started. After nearly twenty years apart, he finds himself pitted against his own godfather and friend in what clearly is a coming revolution. It’s a bittersweet reunion. Jamie has given his word to Tryon, but will he join his friend and their cause and break his word? We know he has a rebel heart, but he also now has Claire and Young Ian to look after. The title of the episode, “Savages,” is a derogatory term the white settlers use about the Native Americans, but it is really these settlers, and Herr Müller in particular, who proves himself to be the real savage. When his family is wiped out by an outbreak of measles he blames the Cherokee for putting a curse on his family, and Claire for letting the curse happen. 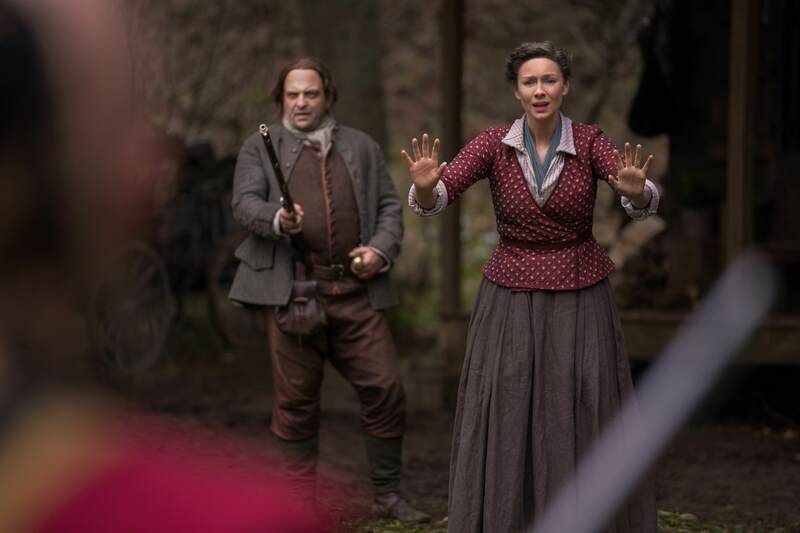 Claire is warned that Müller is out for blood, and arms herself. When she’s finally confronted with the brutality of how Müller exacts his revenge on the Cherokee it disgusts her. Müller has murdered and scalped the Cherokee healer woman Claire had grown close to. Müller may have started something bigger than himself, a conflict between the settlers and the Cherokee that Claire and Jamie may find themselves in the middle of, as well as the uprising of the Regulators against the British Crown. After the Cherokee murder Müller and his family for what he did to their healer, can Claire and Jamie avoid the brewing storm of conflict, or will they be sucked into it? Roger knows Claire and Jamie are purported to have died in a cabin fire, is it the same kind of cabin fire Herr Müller met his end in, or do they escape and flee with their lives, and are only presumed to be dead? During the cabin burning there is a wonderful shot as the Cherokee shoot flaming arrows into Müller’s cabin, where Frau Müller is framed in the burning doorway of the cabin reminiscent of the shoot of Ms. Danvers in the flames of Manderlay in Hitchcock’s Rebecca. It took my breath away. Brianna feels she can join her mother and father, and possibly save them from their fates, so she travels to Craigh Na Dun and travels back through the stone like Claire did. What is it that makes her and Claire able to do this? Is it Brianna’s birthmark that Jamie saw in a dream? Will Roger follow and join her in the past, or is he stuck in the 1970’s following Brianna’s trail through time? We’ll have to wait until next week to find out. this is my first time ever of writing anything pertaining to this show Outlander (which I love) and I am hoping that someone can answer the following questions. Why have the removed episode 5 Savages title from session 4?? Why do they have it under episode 7 Down the Rabbits hole? Are they going to correct this anytime soon???? There is also no new time set up for release of the next episode , and will that one be the correct new episode to be released with Brianna or will it continue to be messed up?? ?